Phil Lazenbury joined our band as musical director in February 2008. Phil was in the Life Guards Band, for 28 years. He was principal violin and leader of the Band of the Life Guards Orchestra and held the post of principal clarinet in the band. He also led the Jazz Quartet on piano. During his time in the Life Guards Band, he studied as a pupil at the Royal Military School of Music, Kneller Hall, on violin, clarinet and piano, and has successfully completed the Band Sergeant Major's course, later becoming the Band Corporal Major (WOII) of the Life Guards Band. Phil is currently teaching violin, clarinet and piano in the Windsor and Maidenhead area, both privately and in local schools. For the last 14 years he has been the Musical Director of the Ercol Brass Band, who have the enviable privilege of playing for the switching on of the Christmas tree lights in Trafalgar Square. 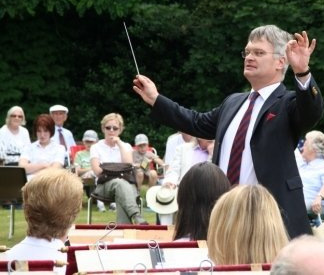 He is also Musical Director of the Burnham and Binfield Concert Bands, and a tutor for the Binfield Music School trust.